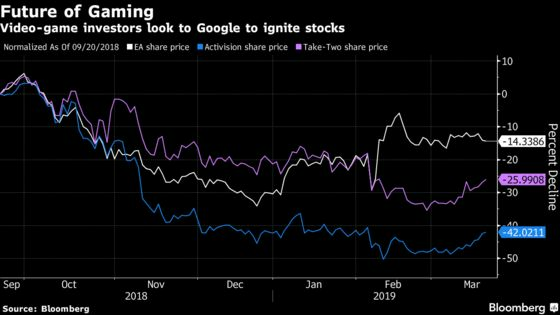 (Bloomberg) -- Video-game publishers such as Electronic Arts Inc., Activision Blizzard Inc. and Take-Two Interactive Software Inc. are poised to be the biggest beneficiaries from Google’s new Stadia service, according to analysts. Alphabet Inc.’s Google may expand the gaming market with its streaming platform that bypasses the high barriers of entry typically associated with the ecosystem -- expensive consoles or personal computers, Bank of America analyst Justin Post said in a research note Wednesday. Game makers will just need to evolve their business models, he said. The new service could also entice more people to play by reducing long download times and computing limitations. It could also allow for more advanced game play, including battle royale modes with thousands of players at once, according to Post. Google’s foray into gaming could also lead to more deal-making in the space. BTIG LLC analyst Brandon Ross said in a March 17 note that he expects big tech companies will look to buy video-game publishers. Post also sees potential acquisitions of gamemakers as well as attractive content licensing deals.